"I'll teach you it's not healthy to gamble with kids." By 1950, the Gene Autry westerns were starting to get a bit threadbare. Even though he still had a popular radio program, he was getting a middle-aged spread and his face started to show the jowliness of age. This odd entry in Autry's canon finds him conflicted between getting a teenage boy to straighten up and letting him make his own mistakes. 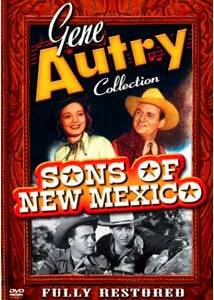 Autry is appointed executor for a deceased friend, and goes to New Mexico to take care of the estate's ranch. It comes complete with the rebellious teen son, Randy Pryor (Dickie Jones) and his cousin Eileen (Gail Davis). Although he at first takes a hands-off approach, when he finds out Randy is in deep with a gang of corrupt gamblers headed by Pat Feeney (King Kong's Robert Armstrong), Autry feels like he has to get involved. But not all works as rosily as usual, and Randy ends up framed for murder. There's a surprising amount of teen angst and rebelliousness on display here; if it didn't have such a sappy denouement, Sons of the West could be seen as a precursor to Rebel Without a Cause. But as it is, it's just another pat B-Western, though the murder is fairly brutal for viewers used to discreet and tidy gunfights. On the positive side, there is a horse race about a third of the way in that's extremely well shot; it gets the adrenaline pumping just as much as watching the Kentucky Derby. Autry also takes an unusual beating here, instead of being his usual triumphant self. Autry is really showing his age, and that makes the pairing with young ingenue Gail Davis more than a little creepy. Autry must have liked her, though, since she went on to be a leading lady in 14 of his last 25 pictures. She's pleasant enough, but there's no real chemistry between them and she's mainly window dressing. Dickie Jones is just whiny and annoying, and frankly unsympathetic on all counts, though his character does have some unused potential in its troubled teen template. The brightest spot is veteran Robert Armstrong, who makes his Feeney both unctuous and pleasant. Also seen amongst his henchman is the Lone Ranger himself, Clayton Moore. About half of the picture is an extended recruiting ad for the New Mexico Military Institute. Apparently military school primarily consists of playing polo, or at least it did in 1950s Hollywood. Those looking for Autry songs will be disappointed since there are only three: the bluesy and memorable Can't Shake the Sands of Texas from My Shoes, There's a Rainbow on the Rio Colorado and The Honey Song, a cringeworthy romantic ditty directed at Davis. Image Transfer Review: The original full frame picture looks pretty good for its age. Restored by the Gene Autry Foundation, the source material is practically pristine, with only occasional speckling visible and no serious defects. It's quite clean, with a good greyscale and decent black levels. Detail is acceptable, though there's a bit too much edge enhancement for my tastes, and a fair amount of aliasing is visible. A bit more care could have been taken in compression, and the use of a dual layer disc might have helped. Audio Transfer Review: For 50-year-old mono audio, this doesn't sound half bad. There's a little mild hiss, but no significant noise. Dialogue is crystal clear throughout and the music sounds good, even if it lacks depth and presence. It certainly could sound a lot worse, so the grade takes into account the inherent limitations of the mono track. Extras Review: The usual array of extras from the Gene Autry Collection are found here: Gene and Pat Buttram talking about the picture on Melody Ranch Theater (though in this case Pat hadn't seen the film before, making it a shade awkward), a program from Autry's radio show Melody Ranch (celebrating his 10th anniversary on the air, as of July 29, 1950), and assorted galleries of interesting materials. There are bios and filmographies for Jones and Davis, as well as three trailers for the film: one in English, one in Spanish, and a Swiss export trailer. A .pdf file of a period illustration for coloring (seen in the advertising material) is also provided for your Crayola amusement. Not a great deal of substance, but more than one would otherwise expect on a B-Western. A pretty forgettable Autry Western, buoyed by a fun turn by Robert Armstrong as the bad guy. The usual accumulation of extras supplement nicely restored picture and audio.